This native tree (Cercis canadensis) parades profuse blooms in early spring, but don’t let the name color your thinking. Salad days? The redbud is cauliflorous – a botanical term that describes the unique flowering along the woody, bare trunk, as opposed to blooms at the end of twigs. But if you were thinking about unrelated cauliflower, take note: adventurous diners might consider topping their salads with redbud flowers, which reportedly are sweet and tart. Just make sure they’re correctly identified and not chemically sprayed. Hearts of gold: In late spring to early summer, the eastern redbud’s fading flowers give way to over-sized heart-shaped leaves. The foliage turns lovely gold in autumn, creating a colorful backdrop for the tree’s seedpods. Peapod seedpod: During the summer, the tree develops long pods, each containing six to 12 smooth seeds that resemble peas. The pods darken and hang until winter awakens as if nature decorated the tree with slender brown holiday baubles. Old traditions: Virginia has recorded redbuds in most every county since early times. Native American tribes used redbud bark and leaves to concoct medicinal potions, and they made dyes from its roots. Natural beauty: Today, the eastern redbud is prized as a striking landscape ornamental. You can plant it as a single specimen, or scatter several along woodland margins and naturalized settings. Also, be on the lookout for it growing in the wild. Short-lived: Enjoy a redbud while you can: Its lifespan averages about 75 years, which is much shorter than that of native oaks and pines. To support the tree’s health, watch for harmful insects, canker, blight and other conditions that can take their toll. “Judas tree”: One legend suggests that this nickname is tied to how Judas Iscariot hanged himself on a redbud tree, causing the formerly tall, strong tree to forfeit its stately structure – and its white flowers to blush with shame. Or perhaps the original nickname was “Judea’s tree,” referring to its presence throughout Judea. 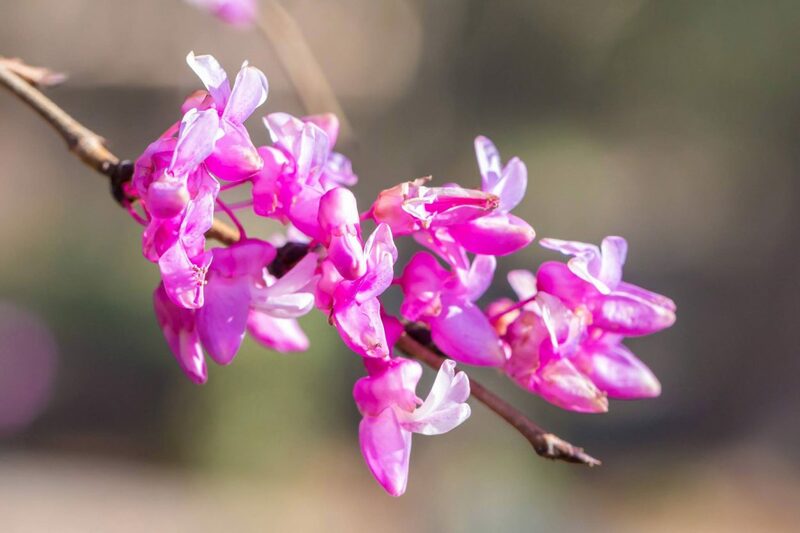 Don’t delay: see eastern redbuds in bloom now at Lewis Ginter Botanical Garden. This article was first published in the Richmond Times-Dispatch.